Compared with previous technology rollouts (2G, 3G, 3.5G), LTE is by far the fastest adapted technology that the wireless industry has seen up to now. But despite today’s LTE deployments being advertised as 4G by all marketing departments of all network operators, strictly speaking they are not 4G. LTE as defined in 3GPP Release 8 does not meet all IMT-Advanced requirements set by ITU to be designated a true 4G mobile communications technology. The 3rd Generation Partnership Project (3GPP), the standardization body behind LTE, is addressing and exceeding these requirements while standardizing LTE-Advanced as part of its Release 10. This webinar focuses on carrier aggregation, the feature that is most in demand within the LTE-Advanced feature set. 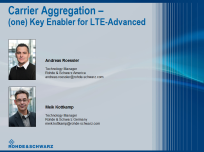 It also outlines how carrier aggregation is supported by leading test and measurement solutions for LTE and LTE-Advanced from Rohde & Schwarz.